A rather immature man couldn’t handle rejection after he tried to woo a lady and this caused him bring out his true colour by sending her a very immature message. 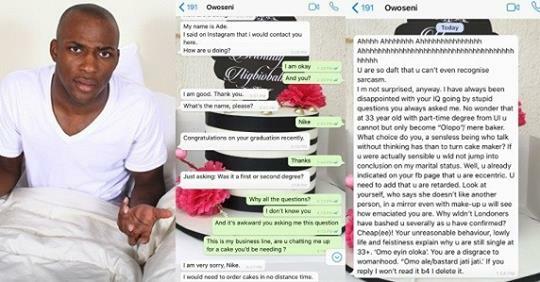 The man, whose name was given as Ade, contacted the lady on social media and tried to make friends with her. He then told her his intentions for her as he revealed that he will be returning to Nigeria soon from the UK and wanted to meet her to discuss how much he likes her. But the lady bluntly told him she wasn’t interested in starting anything with a married man – it was at this point he switched to his real self by sending a lengthy and insulting message to her. Meanwhile, some social media users have actually come to the man’s defence.